Forty years on from the unveiling of Ferrari’s first ever mid-rear-engined V8 berlinetta, the 308 GTB, the Prancing Horse opens a new chapter in its 8-cylinder history. The front is characterised by the dual grille opening which channels air into the two radiators. There is also a double front spoiler which, on close inspection, looks very like those of the F1 single-seaters. At the centre two pylons are combined with a deflector which channels air towards the flat underbody. The bonnet has pronounced, raised central section and two side channels. These channels have the dual function of making the car look more sporty and channelling the air from the two vents in the bumper which have been skillfully hidden from sight in the front view to keep the lines clean. The tail is dominated by the blown spoiler and the large air vents which help improve the car’s aerodynamics. The new exhaust tailpipes have been repositioned to accommodate the greater height required for the diffuser. The overall result exudes a sense of power and performance. A new colour, Rosso Corsa Metallizzato, was developed to underscore this model’s supremely sporty character as well as its unique elegance and exclusivity. Seen at close quarters, it has a surprising depth and glossiness achieved by using a triple-layer formulation in which millions of micro-particles are suspended in the paint. The 488 GTB’s cabin was designed to exude extreme sportiness without sacrificing occupant comfort. This heightens the impression of a cockpit tailored around the driver’s needs: the commands not clustered on the steering wheel are on the wraparound satellite pods which are angled directly towards the driver. The new lighter, horizontally more compact dashboard features ultra-sporty air vents inspired by military jet air intakes. The overall result is an effortless marriage of innovative volumes and compact, functional forms. The design references typical Ferrari traits, such as the clear separation between dashboard and tunnel, the multifunctional steering wheel, the control bridge on the tunnel. All beautifully handcrafted with materials and trim that are both elegant and sporty, with a strong emphasis on creating functional spaces. The characteristic longitudinal F1 bridge has become a Prancing Horse icon and, in practical terms, frees up plenty of storage space for small items while the main function buttons are now in a more ergonomic position. Meticulous attention was lavished on the various odds and ends compartments which provide generous storage space. The 488 GTB’s new door panels feature a more comfortable, ergonomic armrest. The design is very clean and sporty while the buttons are very easy to reach. Great thought also went into the new seats which have fixed headrests. They are even lighter and offer extremely high containment while being very comfortable. The 488 GTB boasts a new Sport infotainment system designed for ease of navigation which keeps the various functionalities immediately to hand and integrates with the overall aesthetic. For the first time in a Ferrari, the 488 GTB’s key, itself inspired by the shape of the V8’s intake plenums, features keyless start. 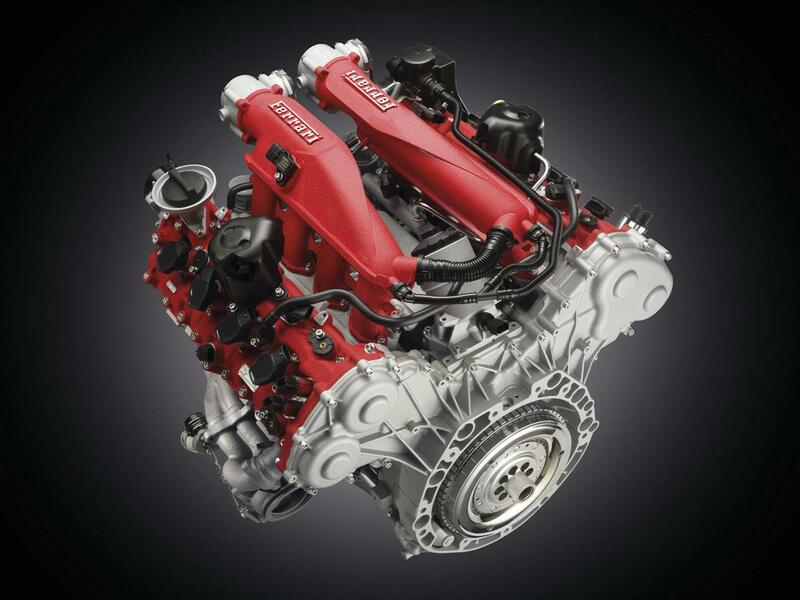 This 3902 cc power unit is the Prancing Horse’s most high performance engine ever with zero turbo lag and a unique, seductive soundtrack. Numerous components contribute to the powertrain’s exceptional response times. The turbos are on ball-bearing-mounted shafts to reduce friction and the compressor wheels are in TiAl, a low-density titanium-aluminium alloy, which, thanks to its lower inertia, ensures maximum spool-up speed. In addition, twin-scroll technology directs the exhaust gases from each cylinder through separate scrolls and increases the efficiency of the exhaust pulses for maximum power. Aerodynamic solutions derived from Maranello’s experience on the track augment downforce without increasing drag, resulting in an efficiency figure of 1.67, a record for a road-homologated Ferrari. Downforce is 50 per cent higher than on the previous model despite drag being reduced. The front of the car is dominated by the central Aero Pillar and an F1-inspired double spoiler which boost the efficiency of both the radiator and downforce generation. 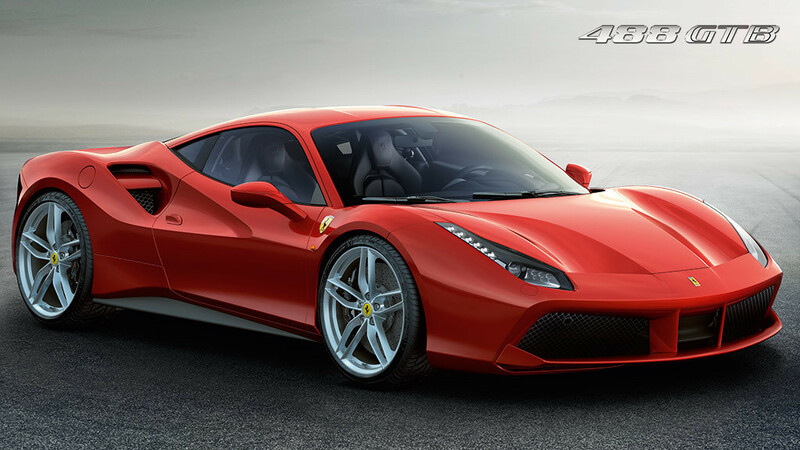 The 488 GTB has an innovative aerodynamic underbody that incorporates vortex generators, special curved aerodynamic appendages which accelerate the air thereby reducing pressure. The result is that the car’s underbody is “sucked” down to the ground and downforce is higher but drag is not. This contributes to overall downforce generation of 325 kg at 250 km/h. The large rear diffuser has curved fences which optimise the expansion of the huge amount of air channelled under the car. It also features variable flap geometry controlled by a CPU, integrated with other vehicle control systems, which adjusts the balance between increased downforce (flaps closed) and drag reduction (flaps open). The Ferrari-patented blown spoiler is a new solution. Air enters an intake at the base of the rear screen and exits via the bumper. This guarantees increased downforce and avoids having to extend the height of the rear spoiler and thus helps keep drag low. The base bleed air intakes on the car’s sides are divided by a central flap. The flow over the upper part of the flap, which is also used for the engine air intake, is deflected and exits from the tail area to reduce the drag caused by the low-pressure wake directly behind the car. The flow from the lower part of the flap goes to the intercoolers to cool the intake charge.